Capsule Summary: Hawkeye makes up a fictional captain and things quickly get out of hand. Poor Trapper looks like he’s having an existential crisis. The next day, Hawkeye tells Trapper that Tuttle was his imaginary friend when he was a kid. Radar hears the story, too, and reveals he also had an imaginary friend, a girl named Shirley. When Radar brings requisition forms for Henry to sign, Henry starts asking questions about Captain Tuttle. He also wants Tuttle to serve as officer of the day. From there, events quickly spiral out of control. Suddenly, everyone wants to know about Captain Tuttle. Frank and Margaret have questions of their own. Hawkeye, Trapper, and Radar are forced to fabricate a personnel file for Tuttle. Hawkeye even has to impersonate General Clayton. Unfortunately, the real General Clayton announces he’s coming to the 4077t to give Tuttle a commendation. Is this episode at all plausible? No, I don’t think so. But that’s what makes it so funny. There’s no way Hawkeye, Trapper, and Radar should’ve been able to trick everyone, to convince so many people of Captain Tuttle’s existence. Yet somehow they pull it off. However, it is a little difficult to believe Margaret would be fooled Hawkeye’s impersonation of General Clayton. Hawkeye eulogizes the late, great Captain Tuttle. Didn’t mean to tittilate [sic] (or should that be tuttlate?). It was the story of a lowly private in the Russian army in Napoleonic times, who volunteered to act an officer’s clerk, even though the private was barely literate. He just wanted to able to work in a cozy, warm office instead of being out in the freezing cold. The first time he was required to take dication [sic] from the officer, the private, a pen in his totally (or should that be tuttaly?) inexperienced hand, he was in trouble. The letter was sent out to a totally fictitious officer. What happened next, you can guess, considering the nature of this thread. I was so taken with the idea of the play, I checked into its availability for an American adaptation. Other ideas and events intervened, and I never got around to doing one. And, then, along came MASH…. Gelbart is referring to a 1962 French play titled Lieutenant Tenant, written by Pierre Gripari, based on a novella by Yury (Yuri) Tynyanov. Hawkeye’s speech (about Tuttle) was written after we did the exteriors. Just felt that sort of euolgy [sic] was necessary. That’s why we had to shoot it on the set. Tuttle’s parents were named after Larry Gelbart’s mother and father. Tuttle’s serial number was Gelbart’s Army serial number. Sparky (aka Sgt. Pryor) makes his one and only on-screen appearance in this episode. Radar is seen reading an issue of Captain Savage and His Battlefield Raiders that wasn’t published until January 1969. Klinger does not appear in this episode. 1. The bogus personnel file (and the scene in which Hawkeye & Trapper create it). 2. Col. Blake & Radar. The already established interplay between the hapless Henry and his right hand Corporal is used to make Tuttle “real” to the entire camp. Henry’s “I had breakfast with the man yesterday” cracks me up everytime. On a personal note, Tuttle is the episode I used to introduce M*A*S*H to my kids many years ago. They immediately fell in love with the series and watch it regularly. An altogether funny episode, if you can suspend your belief in what transpires. IMO, An exercise in human gullibility. I believe this was the only episode where a non-existent character was credited with an appearance. 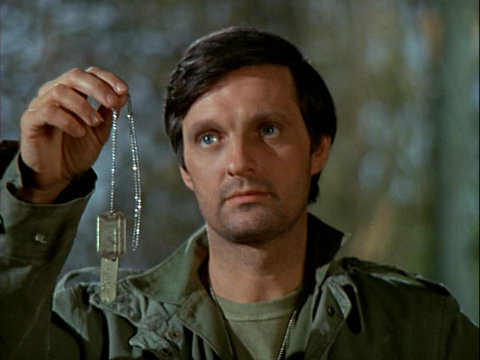 A perfect example of how M*A*S*H could be really clever as a comedy – Hawkeye’s eulogy seals the deal: “There’s a little Tuttle left in all of us. I guess you could say all of us together made up Tuttle.” Perfect. Klinger wasn’t in this episode because he wasn’t a regular yet. In addition to Sparky, Sister Teresa also makes a rare, on-screen appearance as well – the first of only two (the other being “Kim” when she finally reunites Kim with his real mother). One thing that surprises me about this episode is this one line from Frank: “Oh, Margaret, you’re my snug harbor, I don’t know what I’d do if I didn’t have you to sail into.” Wow. Were the network censors asleep that day? Never mind. I got my dialogs confused. I forgot to mention, there’s another never-seen character who made one on-screen appearance later: O’Brien the chopper pilot. He was played by Buck Young in “Dr. Pierce and Mr. Hyde” when Hawkeye tries to convince him not to go up in his chopper anymore; otherwise, he’s refered to quite a bit throughout the series, particularly the earlier seasons. I think if I ever HAD to make a top 10 favorite episodes list, “Tuttle” would make the cut. It’s quite simply an episode I never get tired of, and to me a perfect example of early, ‘funny’ M*A*S*H. As far as the first season goes, it may not have any ‘deeper’ elements (such as “Sometimes You Hear The Bullet”), but for sheer comedy, it’s hard to beat. It’s probably my favorite episode of that entire first year. The scene where Hawkeye, Trapper and Radar forge Tuttle’s documents is a riot, Hawkeye’s General Clayton impression always cracks me up, and the entirety of the eulogy is fantastic. And the end credit of “Tuttle as himself” is a hilarious; I didn’t notice that for years! Also, as a big HILL STREET BLUES fan, I always get a kick out of seeing James B. Sikking show up in this one. I’m a big Hill Street Blues fan too. I keep meaning to write a fan letter to James B. Sikking but I wouldn’t know where to start. I love Tuttle, definitely in my top five episode. It’s silly and far fetched but it’s a funny concept and well acted and well executed, plus we get to see Sparky. What’s not to like? Whenever I tell people about why I love M*A*S*H, this is one of the episodes I bring up, and it’s a prime example of why the Trapper-Blake years were unquestionably the best. The dynamic between Henry and Radar is just so good, and Trapper really is the perfect side kick for Hawkeye, in a way BJ could never quite get to. To this day I’m still saddened when I think about McLean and Rogers leaving the show, which IMO was eventually one of the things that made Gary leave too. If McLean and Rogers had stayed, I have no doubt that Gary would have as well, and I always wonder what the show would have been like with more years of them. Sure it’d mean we never get Potter, and BJ, maybe Winchester too, and as much as I love Charles & Potter, I still wish so much it had stayed the way it was those first 3 seasons. Winchester together with Trapper and Blake would have been super interesting too, although I don’t think it would top the fighting/bickering between Charles and Potter, especially when he first showed up. I wonder if there was a scene explaining the package sent to Tuttle that was cut. Just rewatched “Tuttle”, and it really is one of my favorites. A few moments had me outright laugh out loud, even after seeing it 6-7 times. The scene where Clayton shows up is the best for me. I also like Frank’s “He’s probably a Nazi” line. Tuttle would have turned 18 in 1942, so it would be a bit absurd for a US citizen to be attending university in Berlin, smack dab during WW2. I always wonder what/where Hawkeye/the 4077 gang was during WW2.